From the 2nd - 7th December each blog hop participant will reveal their Xmas tree and baubles on their own personal blog. There are some amazing bloggers taking part such as Bianca from my favourite interiors blog French For Pineapple, as well as Geraldine from her candy-coloured blog Little Big Bell. I'll list all the participants taking part at the bottom of this post, but for now - here is my tree and accompanying baubles! Balsam Hill very kindly gifted each blogger in the hop one of their realistic artificial Christmas trees, a tree skirt from their vast range, plus some bauble sets of our choice to decorate our homes for Christmas. I went for a European Fir because I liked its natural shape and design. I have never had an artificial tree before, thinking they all looked like the artificial trees you get in DIY stores! But boy, this tree is something else - it looks completely real, you would never know it was artificial, even looking at it up really close! The past two years my tree has been dead on Xmas day, not to mention the struggle of trying to wrestle a 6ft real tree in a Fiat 500 with a toddler in tow a few weeks before Xmas. Now I can relax knowing that the tree will still be looking this good on Xmas day, and I won't be picking pine needles out the dogs paws for weeks after the main event. 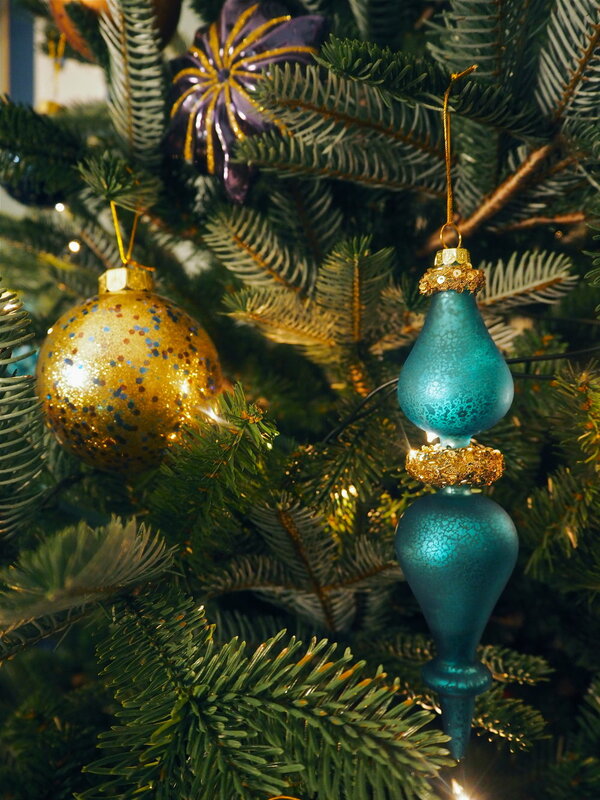 To complement my Dix Blue walls, I went all out with the hand-painted Georgetown bauble set which contains 35 baubles in a navy, copper and turquoise colourway. These baubles are so stunning. They come individually wrapped in tissue paper in 3 separate boxes and each design is slightly different to the next. I also went for a beautiful faux fur tree skirt in Ivory. As the tree is artificial, you need something to hide the base and this tree skirt is so luxurious and soft. It makes the perfect bottom layer for presents to be piled up upon. To see the other posts in the Trees & Baubles blog hop, click the links below! * This post is a collaboration with Balsam Hill, however all thoughts and opinions are my own! Huge thank you to Mint & May and Oasis Home & Hobby who also provided some decorative pieces for this post. Liked my Xmas decor? Sign up to get my other Xmas posts sent straight to your inbox!